NAFlex provides a friendly environment to setup new systems and run test simulations. With this short tutorial, you will be able to prepare a molecule to run a molecular dynamics simulation, following just a few steps. The first thing to do is choose between working as an anonymous user or alternatively as a registered user. We strongly recommend working as a registered user, as it has some important advantages. Anonymous user's projects are completely removed once the user is disconnected and also when session expires (after some minutes of inactivity), and therefore working as anonymous user is only suited for a first impression of the web server. Registration process will just take a minute --> Registration. Once logged in, the user workspace appears. In this workspace, all projects of the user will be shown. Now, we are ready to start our first NAFlex project. 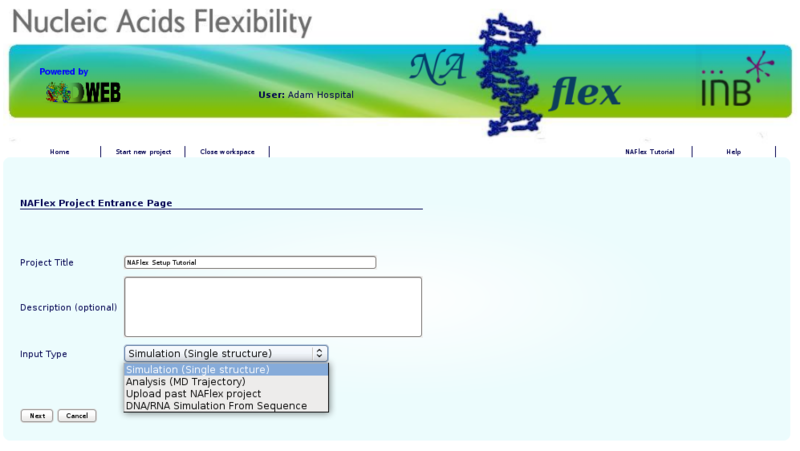 NAFlex user can choose between four different kind of inputs, Simulation, Analysis, Upload a past NAFlex project and DNA/RNA simulation from sequence. In this tutorial, we will see an example of a Setup (Simulation) project. You will be asked for just three easy inputs: a project title, an optional description of the project, and an input structure, either as a PDB code / Swiss-Prot code or directly as a PDB structure file. Just after creating the project, you will be redirected to the so-called Checking page. 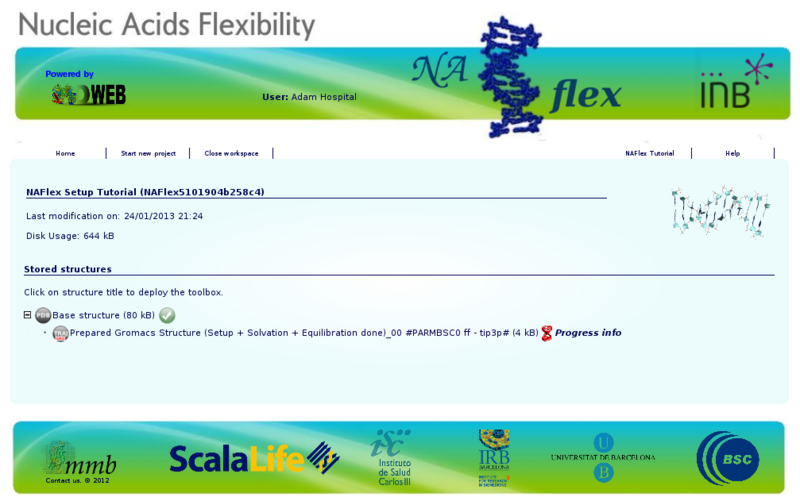 In this page, NAFlex will show a list of possible problems found in the input structure that can affect to a future Molecular Dynamics Simulation. User can interactively inspect these problems thanks to a JMol applet coupled to each of the problems, helping to locate them on the real tridimensional structure. In this particular case, we are trying to work with the well-known B-DNA dodecamer d(CpGpCpGpApApTpTpCpGpCpG) (pdb code 1bna). At the right part of the screen, you will find all the possible problems identified, whereas at the left part of the screen the JMol applet with the structure loaded will be shown. 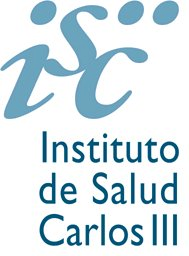 When clicking the next button, an intermediate information page will appear, listing the most important information chosen in the previous Checking page, i.e. alternate locations and ligands discarted/taken, and showing the part of the structure (chain/s) chosen for the project in a JMol applet. At this point, we already have our structure loaded into NAFlex workspace. Now we are going to choose a workflow from the list of possible operations, after clicking at the New Operation icon . 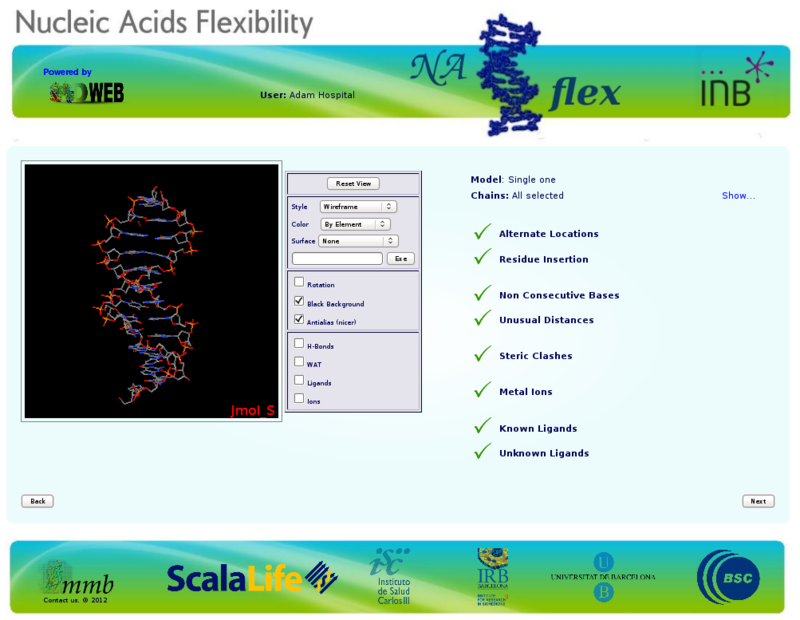 Our goal is obtain a system completely prepared to begin a Molecular Dynamic Simulation with Gromacs package. So we will click at the operation named: Gromacs FULL MD Setup. Note that choosing operation Namd FULL MD Setup, a system for Namd Package with Charmm forcefield will be prepared, and choosing Amber FULL MD Setup, a system for Amber Package with Amber forcefields will be prepared. 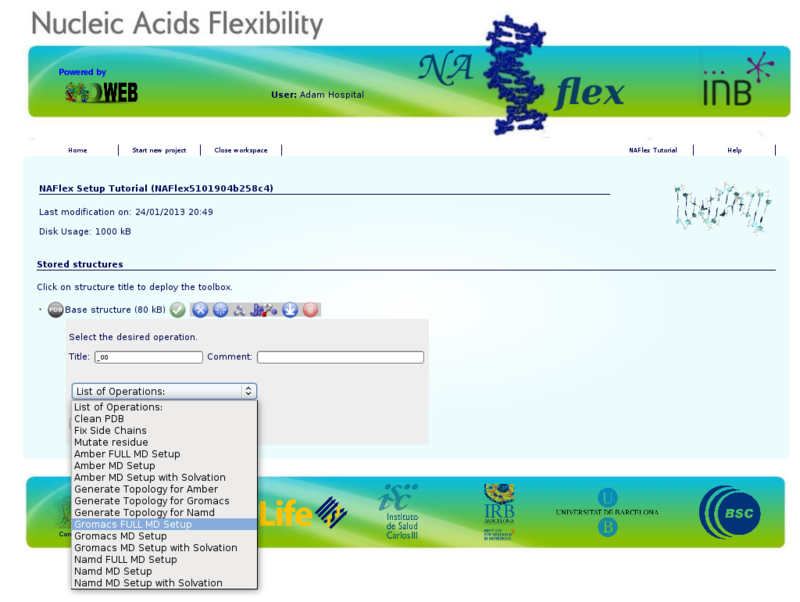 Gromacs FULL MD Setup will run a complete Molecular Dynamics Setup to the input structure. That means going from a protein/nucleic acid structure to a system formed by the molecule submerged into a solvent box, surrounded by ions up to a given concentration, and energetically equilibrated. For a more extended information about the steps done by the workflow, see the corresponding MDWeb help section (Gromacs Workflow FULL Setup). After clicking at the workflow Gromacs FULL MD Setup, it will give us the possibility to choose between a set of different forcefields and Water Type. A force field has three components: equations defining the potential energy of a molecular system as a function of atomic coordinates, atom types, and parameter sets that fit the equations to experimental data. We will just keep the option that is active by default in NAFlex. 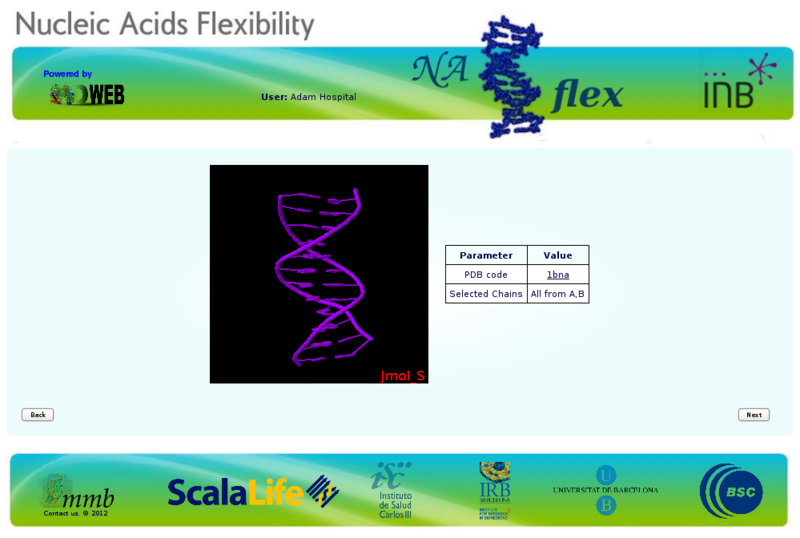 In this case, PARMBSC0 forcefield, a modified version of the Amber parm99 forcefield to improve it specifically to run Nucleic Acids simulations. For the Water Type we will just keep the most used solvent model in combination with Amber forcefields that is the TIP3P model. For more information about differences between force fields and water models, please refer to the corresponding MD program manuals. In this case, user can find these information in Gromacs manual. 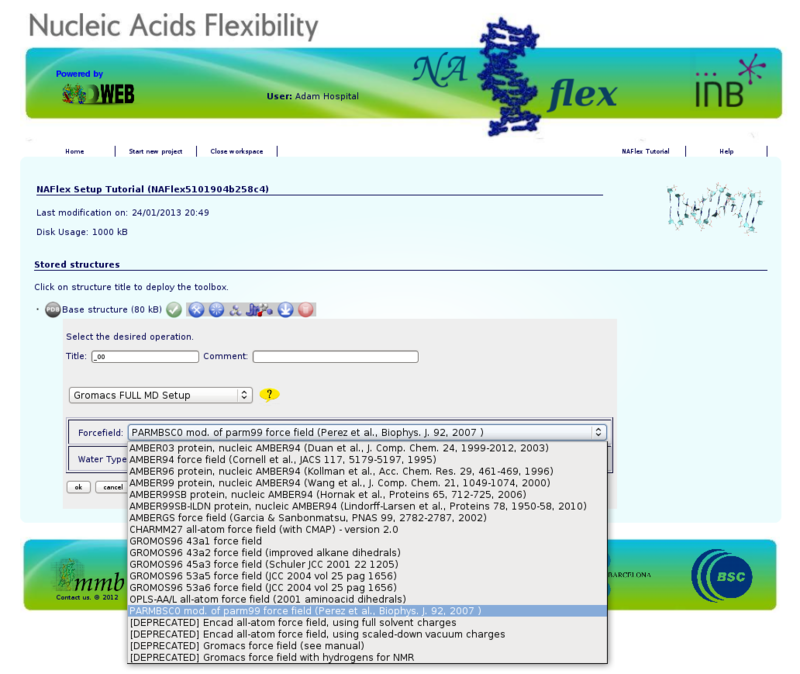 Links to all the web homepages of the MD programs used in NAFlex (where Manuals are freely available) can be found in the corresponding help section (Related Links). Once the workflow is launched, we just have to wait for the results. 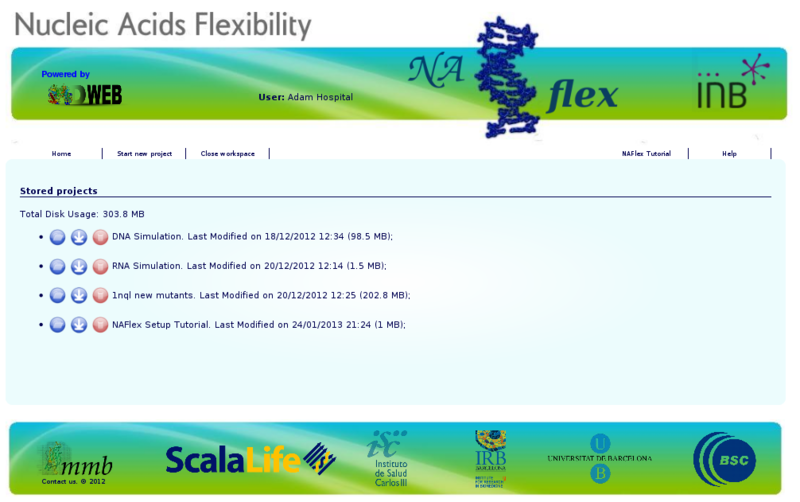 NAFlex will be automatically reloaded from time to time after checking if the process has already finished. Meanwhile, you can follow the progress of it clicking at Progress Info whenever you want. When clicking at Progress Info, a new page will be opened showing the progress of the workflow step by step, accompanied by a figure of the whole workflow. This way, you will be able to know at any moment which service is being executed, how many steps have been already computed, and how many steps left. NAFlex offers you the possibility to leave your processes running (as sometimes they will be long processes), disconnect from the server, and reconnect again later on, to check the progress of your projects. The list of projects is easily accessible from the user workspace page (just clicking at Home link). Once the workflow has finished, you have the possibility to download the data generated, just clicking at the download icon . Now you can work with your system, already prepared to run an MD Simulation with Gromacs package. The downloaded compressed file has all the necessary inputs to run the simulation, but still you will need to prepare the configuration file needed by gromacs to begin the run with some key parameters like the MD ensemble, simulation time, time step, etc. But don't worry, if you are not familiar at all with Gromacs, MDWeb will help you preparing these configuration input files for you. Check MDWeb help pages, and more specifically, the Run Simulation Tutorial section. This example is done with Gromacs package, but NAFlex also offers a complete setup workflow for working with Namd package with Charmm forcefield or Amber forcefields. The complete list of workflows can be found at MDWeb help pages (NAFlex List of Workflows).